The following review will explore the facts about a product called Homeopathic Yeast Relief Formula. This product claims to be a natural supplement that will assist with the relief of symptoms such as vaginal burning and itching related to yeast infections. It also claims to use ingredients that will assist to manage the growth of yeast. 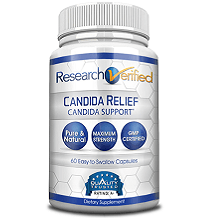 Candida albicans is a yeast germ naturally found in your digestive tract, this ingredient may be beneficial for restoring the proper balance of yeast. Pulsatilla helps with conditions of the male and female reproductive systems such as menstrual cramps and urinary tract disorders by diminishing pain, fever and bacteria. Sepia is generally used for the treatment of yeast infections that cause a yellow itchy discharge and may also benefit issues regarding female reproductive organs and assists with hormonal balance, however, if used for long periods or in high doses, there may be side effects such as dizziness, nausea, headaches according to research. Thuja occidentalis contains chemicals that may help to fight off viruses although research suggests that in high doses, it can cause seizures, vomiting and painful diarrhea. The manufacturer suggests that adults and children older than 12 should take two tablets three times per day until your symptoms diminish or alternatively, with the advice of a doctor. It is advised that these tablets can be dissolved under your tongue or you may chew them. The manufacturer warns that if your symptoms continue for longer than ten days, you should consult a doctor. This product is suggested to be kept away from children and it unfortunately does contains some allergens. Although no side effects have been listed by the manufacturer, it may be worrying that some of the ingredients used may have mild to moderate side effects such as dizziness and nausea and other severe side effects include possible seizures, vomiting, and painful diarrhea according to research. You can purchase this product online and a bottle that contains 90 tablets will cost you $5.00 when purchasing directly from the manufacturer’s website. There does not seem to be any discounted options available. The manufacturer offers a full money back guarantee and advises that if you are not entirely content with this product for any reason, you may return the unused portion for a full refund, however, they do not refund any shipping costs involved. This guarantee is applicable for a year from your purchase date and you may not request a refund for more than one opened bottle. This homeopathic supplement does seem to be a relatively ok product considering that it does have a money back guarantee and it also has clear, easy to follow instructions. 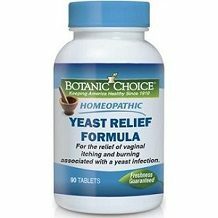 Homeopathic Yeast Relief Formula is an extremely cheap product which may create concerns about quality standards and general effectiveness although it is, however, more concerning that there are no customer reviews available on the manufacturer’s website. Unfortunately, this supplement contains allergens and research suggests that some of the ingredients used do have some severe possible side effects. Regarding all the relevant aspects of this product, it is disappointing that there are no significantly better characteristics when compared to other similar products.